What is Work From No Home About? Just Remove the “No” and You’ll Find Out. I have to admit, the name “Work From No Home” doesn’t make sense because often times, I kept on thinking that the word “No” should be removed instead don’t you think? However despite the funny name, Work From No Home is one of the best online business training courses out there available today. Made by a Malaysian called Peng Joon, Work From No Home is one of the few honest courses out there that really aims at helping normal people like me and you to learn and make money online. However nothing in this world is perfect so do bear with me and read the rest of my review to help give you a bigger picture before you even decide to buy. What is Work From No Home all about? Work From No Home is a training course which teaches people how to start making money online by learning how to build a website and monetizing it afterwards. 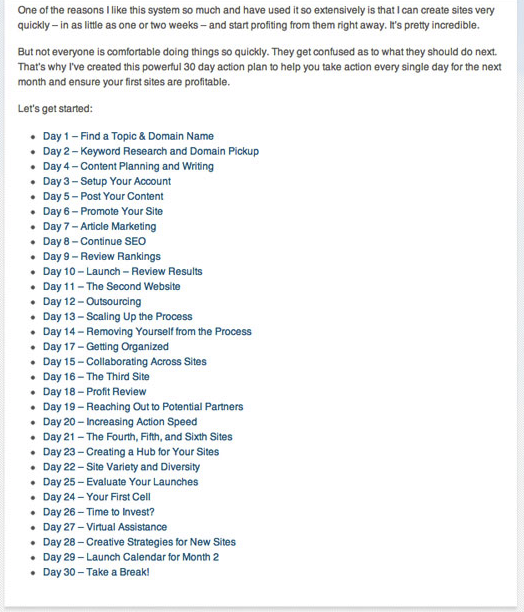 The lessons are laid out in 35 topics which Peng Joon turns into a 30-day action plan schedule so that users won’t get overwhelmed because really, learning how to build a website is no small matter. The course is made in such a way that even beginners or those who don’t have prior experience in internet marketing may learn at ease. However in my personal opinion, it is not suitable for veterans or those who have already had experience doing online business because the lessons aren’t in depth but it is still perfect for newbies. Want a program that’s both newbie-friendly and veteran-friendly? There are no tools whatsoever provided by Work From No Home but it is understandable as the price doesn’t cost much. The lessons are video-based and were recorded by Peng Joon himself with text explanations to help people understand better. I personally think that the videos are nice as it portrays responsibility when the owner recorded it himself and not pay others to do it for him such as in scam products like Quick Sprout University and Dot Com Secrets X. However some people might not like the videos because they are of low quality and do not look like it’s made by a professional. Yes, the lessons do work but only for a few years and certainly meant for future years to come. Although the lessons are in fact part an excellent internet marketing strategy, it is also outdated because the system is not updated regularly to face the new Google updates. For example, one of the modules covered within the program is back-linking which according to Google’s Software engineer Matt Cutts, will soon be of lesser importance in a website. Find a program that’s always updated to suit Google here! Do you get any kinds of support? It costs $1,500 an hour JUST for a live phone call with him! One thing that Work From No Home lacks apart from quality videos and in-depth lessons, is the support. Sure you can email for a ticket and wait for the answer but that will often takes days and time is something we don’t have. Besides, wouldn’t you get extremely agitated when you are stuck in a lesson but you can only get help in a few days’ time? 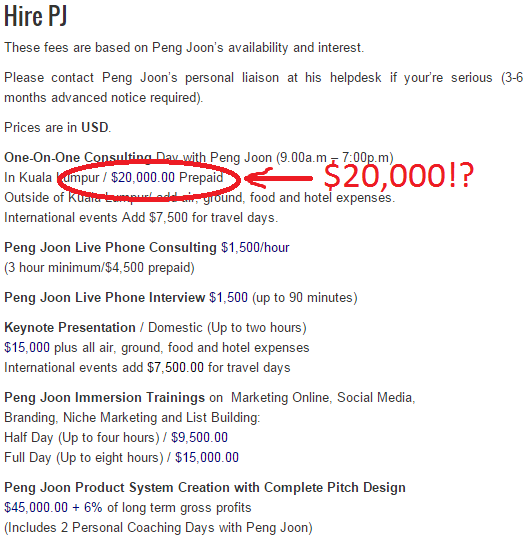 Of course you can opt for a private coaching with Peng Joon himself but that costs an arm and a leg because he charges $1,500 just for a live phone call! As great as Work From No Home is, it can never beat my #1 recommended product because the owners themselves will join its online community from time-to-time to help out the little people like you and me. 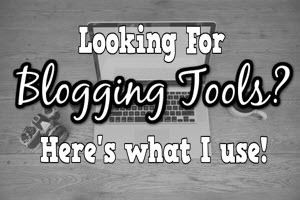 Work From No Home doesn’t have an online community which is a minus for me because sometimes when you’re stuck in the middle of building a website (It’s not easy when you first started doing), you would need someone to help you out and give some advice, would you not? Want a program with an active community which you could learn and get help easily? For $37 with a 60-day money back guarantee and no monthly fees? You bet! Work From No Home is by far one of the most underpriced home business programs out there to match with its quality lessons. Sure there are other programs out there with cheaper price but the product is usually either of cheap quality or a rip-off. There are upsells that Peng Joon offers to make up for that low price however, but you can just ignore them and continue with the lessons instead. 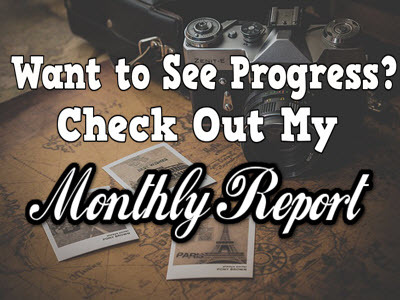 Work From No Home is a great product but due to some features that it lacks such as a helpful online community and updated lessons, it remains number 2 compared to my #1 recommended product, Wealthy Affiliate. Due to its easy-to-understand lessons and video training format, Work From No Home is perfect for beginners and believe it or not, it is also the first ever home business course that I’ve ever tried. 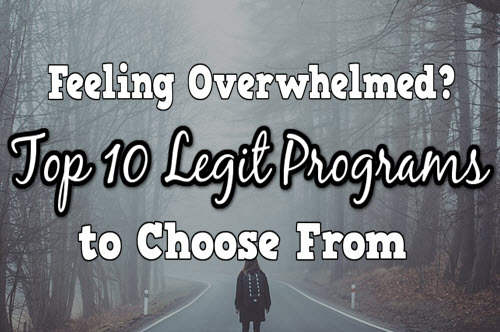 However if you’re planning to go far and keep on learning all the elite website tricks for years to come, then this program may not be for you. Therefore with the beginner-level course, outdated lessons and limited support, Work From No Home is still okay and receives a 2 out 5 and is definitely a LEGIT home business product. If you’re interested in finding a long-term online business course with an active community, do check my full review of Wealthy Affiliate here. Thank you for reading and please, do feel free to share your experiences as I’ll be more than happy to reply. Many thanks for sharing this review on Work From No Home. Your review is one of the most comprehensive and I got some great insights. Thanks for sharing this valuable information to help people like me. Keep rocking and posting this type of informative reviews. All the very best! I will come back to your website to learn more information. Hey, found your website under Patrick Chan Passive income review which is on page 1 2nd rank of google. Honestly, the upsells alone is already a big turn off for me. 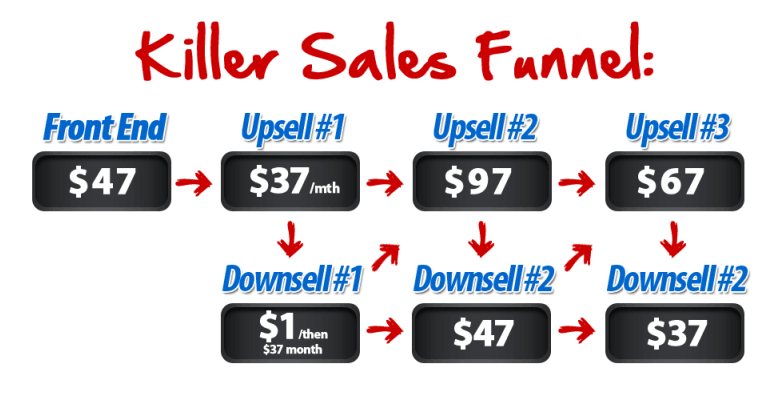 To me, you only need one upsells and upsells can be kinda dishonest if you ask me. What is it so hard about including everything into one package upfront ? Peng Joon is a great Internet Marketer, one of the best ones out there but even I know an outdated program when I see one. You are too kind to give him such a high ranking, Riaz. It is rare to see a good internet Marketer who doesn’t cheat people of their money, Mr Wall. Although it’s outdated, Peng Joon’s product is still helpful compared to countless scams out there. But the reason for me ranking it high is because Work From No Home is the very first program that taught me Internet Marketing and for that, I am grateful. I’ve known Peng Joon as one of the most honest Internet Marketing gurus out there. However lately, I noticed that his products are degrading in value and I think this is because of the fact that he is blinded with money. Great review. 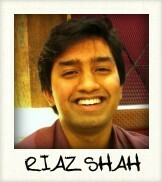 Riaz! Keep up the good work! Thanks Natasha, Peng Joon was great a few years back when he was just starting out but now he’s delving more into MLM and even his products are aimed at sucking more money out of you which is a bit sad to know. Really thorough review! I agree, the title is confusing and I’d think that no support from the company would turn a lot of people off. You have a great website…I really like the design and your logo! Great review! A repeatable process always wins the game! Thanks Fred, consistency is indeed key! Thanks for dropping by . Hello there Jeremy! I would suggest that you start with Wealthy Affiliate because the online community there is very helpful for you especially when you get stuck. You could start with Work From No Home as well but it would be difficult for you to get over an obstacle as nobody is there to help you out with apart from the staff that you will be emailing. I wish you best of luck on your online business journey and do ask me if you have anymore doubts Jeremy! The title had me for a moment, and when I realized I did in fact see “work from ‘No’ home”, all I could imagine was living in a chip van or ice-cream truck.. Ha Ha! All jokes aside, you have clearly explained this program well, and in comparison with the many scams of related names. Work from no home seems to be an amazing place to learn legitimate basics of online business. As you mentioned later however, Their is a whole lot to be learned, and the learning never ends. Having the ability for continued growth is very important for me. I was almost convinced until you brought up Wealthy Affiliate. The extra features within this program seem more convincing..
Would you suggest starting off with Wealthy Affiliate instead? Even for beginners? The title had me as well to be honest lol. Continuous growth is very important when it comes to building a sustainable online business as we always need to be updated to face whatever that comes ahead. I would suggest starting off with Wealthy Affiliate due to the great online community that it has so that you can ask around whenever you get stuck because starting is always the hardest compared to maintaining. I remember how depressing it was when I was stuck at a lesson as I don’t know how to attach my domain to my web host. However if you ever want some ways to save money when it comes to outsourcing, you could always check out Work From No Home, the tips there are ninja! Thanks for dropping by Damian, hop you have a lovely day. Hi Riaz! I love the way you’ve reviewed the “work from no home” course. I actually bumped into this course back in 2012, but decided to not buy it. Anyway, you wrote a very detailed review and I love details! Great job! Thanks Muriel! Its as actually my first home business program that i’ve tried so I wrote according to my experiences with it. Thanks for dropping by !